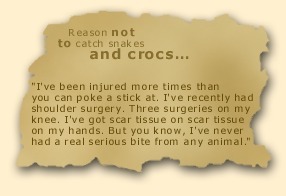 Anyone who gets their very own scrub python for their 6th birthday would have some tales to tell and Steve has plenty! While most other children were opening cans of pet food for their cats or dogs, Steve was out catching fish and hunting rodents to feed to his crocodiles and snakes. As the son of renowned naturalists, Bob and Lyn Irwin, Steve developed a love for critters from a very young age, helping to feed and care for the animals at the family's Queensland Reptile and Fauna Park. Steve's dad taught the young Steve everything there was to know about reptiles - even teaching his nine year old how to jump in and catch crocodiles in the rivers of North Queensland at night! This father and son's proud boast is that every crocodile in their park (now numbering some 100 animals) was either caught by their bare hands or bred and raised in their Park. Steve is now the director of Australia Zoo in Queensland, Australia, and host of that wild series THE CROCODILE HUNTER. As he grew older Steve followed in his father's footsteps and volunteered his services to the Queensland Governments rogue crocodile relocation program which saw him spend years living on his own in the mosquito infested creeks, rivers and mangroves of North Queensland catching huge troublesome crocodiles single-handed. His record of successful catches is still staggering to this day. 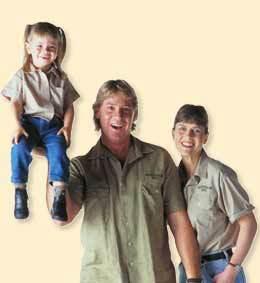 Since 1991, Australia Zoo has flourished and expanded under Steve's guidance. Steve the star was born after a chance encounter with his friend, a television producer who was filming in the Park for TV. In true Steve style they took a punt and the first documentary, "The Crocodile Hunter" was produced in 1992. The tremendous success of this one program quickly encouraged the making of more and so over the next 3 years, 10 one hour episodes were made and on television screens all over the world. Steve has now filmed 50 episodes of "Crocodile Hunter", 52 episodes of "Croc Files", and his next project will be an animated series. Steve has the greatest respect and understanding for all animals - something that has been instilled into him by his family for all of his life - and he's proud to share his passion with everyone who visits his Zoo and with his five hundred million viewers world-wide. In 1992, Steve married Terri Raines, a young American whom he met when she visited the zoo. Terri Raines was born in Eugene, Oregon in the USA. Her father ran a successful construction business - very much a family affair and in 1979 Terri joined her dad to learn all the skills of managing their large trucking business. Terri's dad was constantly bringing home injured creatures from the highways his trucks traversed and this was to eventually instill in her an ongoing commitment to saving and rehabilitating wild animals. In 1986 she started a rehab facility called "Cougar Country" to re-educate and release predatory mammals such as fox, possum, raccoon, bears, bob-cats, and of course cougars back into the wild. Soon she was handling 300 animals a year. Later in 1989 she joined an Emergency Veterinary Hospital to work as a vet technician to gain further valuable knowledge on the care and support of all kinds of animals. Life couldn't have been busier as she still kept a hand in helping her dad run the family business, rehabilitating animals through her "Cougar Country", working spare moments at the Vet Hospital and looking after her own 15 cats, several birds and a dog. Too full for low priority activities like dating. Or so she thought. So it was in October, 1991 that she visited Australia to explore the rehabilitation scene in our wildlife parks. It was while she was on the Sunshine Coast visiting a friend that she decided to drop into the Queensland Reptile & Fauna Park at Beerwah "just out of curiosity". A chance meeting with the man doing the Crocodile demo, Steve Irwin, was to change her life forever. The couple got engaged four months later and married on the 4th June 1992 and honeymooned while filming their first television documentary. her family's business, her rehab centre, her veterinary work and all her beloved pets - but it was almost as if fate had taken a hand. From the dreams of a small child, she was to share her lifelong ideals for wildlife with the world. 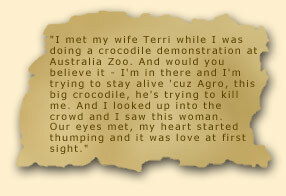 As "the sensible one" on Animal Planet's THE CROCODILE HUNTER, Terri Irwin has won fans all over the world. If you saw Terri braving the murky depths of a croc infested river after falling from the boat you would know this is one capable lady. she isn't the squeamish type.